Amazon has got the Yonanas Frozen Treat Maker (model #902) for $35.89 with free shipping. It received 4.3 out of 5 stars over 1,635 customer ratings. We bought one of these three years ago and we love it..most of the time we use it to make the most inexpensive and healthiest, no-sugar-added mango sorbet imaginable (one ingredient = frozen mango). 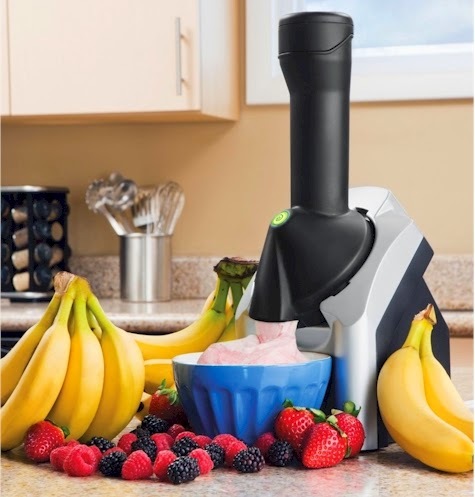 Instantly turns frozen fruit and other flavorings into a delicious and healthy treat. Looks and tastes like soft serve ice cream soft-serve ice cream without additional fat, sugar, or preservatives. Fast and easy to clean; Chute, plunger and blade are all dishwasher safe. Designed for use in US and Canada only. Warranty does not apply elsewhere.